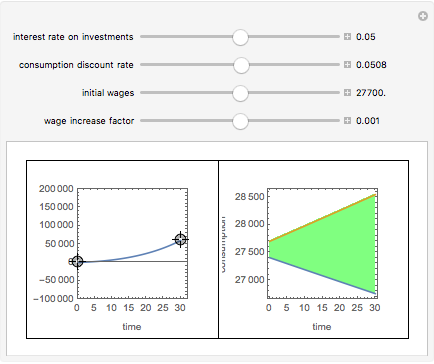 This Demonstration shows the optimal consumption path created by specification of an initial level of assets and a terminal level of assets. 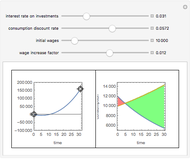 The user may specify the interest rate the consumer could earn on investments, the rate at which they discount future consumption versus present consumption, and their wage trajectory (a starting point and a rate of change). Red areas of the consumption graph correspond to dissavings. Green areas correspond to savings. This Demonstration is premised on the theory of optimal control. 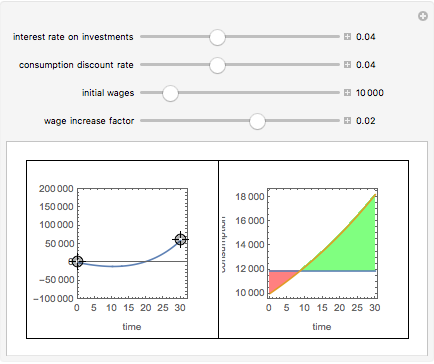 Form a Hamiltonian , where u represents consumption (the control variable), w represents wages, r represents the interest rate, x represents the level of assets (the state variable), and y is a Lagrangian. Then take the variational derivative of the Hamiltonian with respect to the control variable and set it equal to zero, the variational derivative of the Hamiltonian with respect to the state variable and set it equal to the derivative of the Lagrangian, and lastly set the Lagrangian function at the terminal time to be equal to zero. 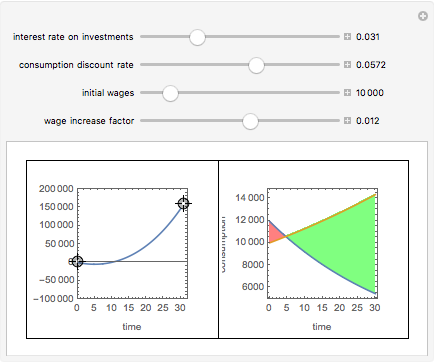 With some complicated calculus and algebra facilitated by Mathematica and its VariationalMethods Package, the plotted expressions for optimal asset and consumption trajectories shown in this Demonstration are created. This Demonstration does not include as a complication a requirement that assets be positive at all times. 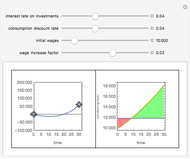 Snapshot 1: a decline in wages coupled with a low rate of discount on consumption and no desire to accumulate capital at the terminal time combine to create savings during the early years and dissavings in later years. 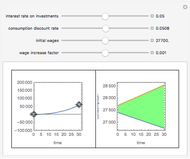 Snapshot 2: setting the interest rate equal to the consumption discount rate results in constant levels of consumption with dissavings in the early years and savings later. Snapshot 3: the individual who needs to reach a high level of terminal wealth saves at a high rate for most of their life even if investment rates are low and future consumption is significantly discounted. Seth J. Chandler "Optimal Consumption Paths"